Without beating about the bush and wasting your time and ours too, let’s get straight to the point. This isn’t a disposer with a motor that promises to beat Usain Bolt. It promises to give you your money’s worth – perhaps more, because you’d be paying only a little money to get it. While it is not the coolest disposer out there, it will fit in perfectly with loners, newlyweds and simply those who don’t have an active kitchen with heavy food wastes. There’s only so much a 1/2 HP motor could do! And if you don’t let yourself forget that, then surely there won’t be any hard feelings. With that in mind, I find the motor to be running at a satisfactory speed of 1725 RPM. You can successfully put light food wastes like peels down its opening – and thankfully, those wastes happen to be the major occupants of any kitchen wastes. And I hope you won’t mind putting the rest, like chicken bones, into the bin. Back to the point – the food waste that you send down the disposer’s opening would be turned into fine particles easily and quickly – say in 10 seconds. On top of that, you can trigger the motor easily even if the food cover is not in place. Though it is very convenient, it can also be a little bit unsafe if you’re having kids around. For a disposer that hasn’t adapted any handy patented technologies, I find it quite hard to believe how silent it is. Obviously, it is not whisper quiet even though it has a Whisper Quiet Polystyrene Sound Barrier. I only meant that it is not loud – and definitely not as loud as the old Badger line. Installation is quite easy – which means that you can save the expense of hiring a handyman. Be the handyman yourself, and follow the steps as instructed in the manual. Whatever the reason is, that puts an end to its survival, it is surely not corrosion. The grinding wheel, 360 degree swivel impellers, and most other grinding components are made up of galvanized steel. There are records that prove the disposer to have lasted over a decade or so. But on average it might last a little under that. A happy and satisfied customer means repeat business. I couldn’t agree more with the above saying. I’ve seen many buyers repeat their purchase every once in 7-8 years and some over a decade of careful use. And the others are just making their first buy – and they’ll probably join the group of repeating customers with time. It goes without saying that Kitchen Aid KCDB250G is amazing enough to be addictive. Kitchen Aid disposers are not the most generous when it comes to warranties. For this particular disposal, you get a warranty that lasts only for a year. I’m giving you a heads up here. Check and test your disposer thoroughly, see whether there are leaks or any other material defects. If you encounter anything that meets the conditions of the warranty, then claim on it beforehand. 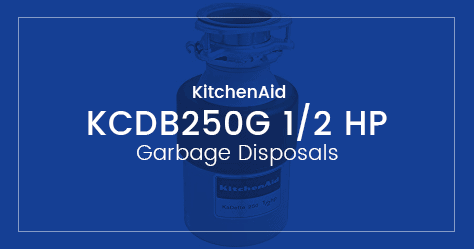 If your looking for a disposal that works and lasts. This is the one. 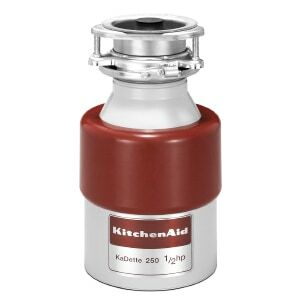 For those who prefer to keep everything simple, I’m pretty sure that Kitchen Aid KCDB250G would be a great choice to consider buying. While it may not boast many features, it doesn’t give false promises unlike many other products on the market. So before you buy, you know what you’ll be buying – and as a result, it won’t disappoint you. For further details and the best deals, don’t forget to check this out on Amazon. However, if you’re interested in buying yourself a 3/4 HP disposer instead, then you should totally check out our review on Waste King L-3300 Garbage Disposer. While it is a bit more expensive – obviously because of its power and warranty, it is one of the best disposers in the industry.